Deadline is December 14 so there is time! I thought it would be better to send this out a little later this time, so that some people would already have their posts ready and can just send them over. PS: If you are not able to make or have a holiday blog graphic, not to worry, we will create one out of the picture you send. 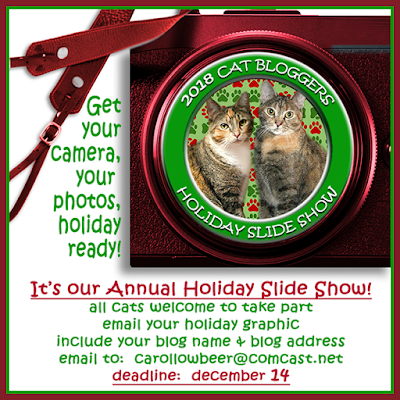 PS: We thank Ann of Zoolatry who has again made a lovely graphic for our slideshow announcement. Happy Holiday slide show to you, and a lovely selfie too. Boy this time of year comes round far too quick, but the decorations and presents are always welcome. You always have a cool yule show! We'll be sending you our card soon! Wonderful! Your slides shows are always so nice! Purrs from Deb and the Zee/Zoey gang. just send picture right? Not sure I understand.